Nelson Valdez scored another game-winner, and Nicolas Lodeiro torched FC Dallas’s back line fort two more as Seattle seized the initiative in the Western Conference semifinals with a 3-0 win Sunday night. 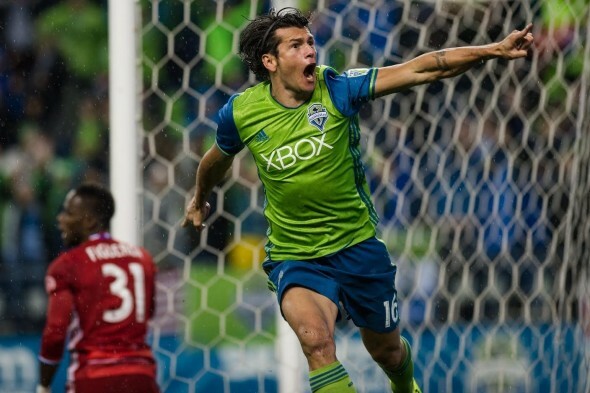 Nelson Valdez scored his second consecutive game-winning goal and Nicolas Lodeiro added two more as the Sounders erupted in the second half, beating FC Dallas 3-0 at home in the first leg of the Western Conference semifinals Sunday. All goals came in an eight-minute window in the second half where Seattle’s offense could do no wrong. The result puts Seattle on the front foot to advance to the Western Conference finals after the away leg of the match-up plays out Nov. 6 (6 p.m., FS1) in Frisco, TX. Because road goals are the first tiebreaker, a lone goal for Seattle on the road will require a 5-1 Dallas victory to advance past Seattle. That kind of score line is far from impossible, but the Sounders have heavily tipped the scales in their favor. Valdez’s goal came in the 50th minute, when Joevin Jones sent in a cross from the left alley. Valdez outjumped Dallas center back Maynor Figueroa, heading the ball past Chris Seitz for his second goal in as many contests. His game-winning goal in the knockout round against Sporting Kansas City Thursday gave him new confidence. The confidence is well-deserved. With two playoff goals in a week and one last year, Valdez is tied for Seattle’s all-time postseason goals record (along with Clint Dempsey, Osvaldo Alonso and Eddie Johnson). Five minutes after the first goal, Jones sent a long through ball to Jordan Morris on the left wing. Morris blazed down the field as defenders gave chase, cutting in toward goal before serving up a slow roller to Lodeiro, who finished it off with a tap as he arrived from the right side. In the 58th minute, Lodeiro bagged a second goal when he sprinted onto another long ball from Jones and went one-on-one with Seitz, beating the Dallas keeper to the open side of the goal. Interim head coach Brian Schmetzer said he was proud of his team’s ability to adapt to the challenges presented by FC Dallas, who claimed the Supporters’ Shield and the U.S. Open Cup this season. Frei recorded three saves, anchored by a defensive unit that was quick to pounce on Dallas’s furtive attack. FC Dallas looked to be taking a defensive stance, playing a conservative 5-3-2 formation that struggled to connect passes in the attacking half. The ability to start Valdez at striker allowed Schmetzer to push Morris to the left wing, with Friberg playing an attacking center midfield role as Cristian Roldan dropped back to play defensive midfield alongside Osvaldo Alonso. Earlier in the year, similar attempts to deploy Morris on the wing failed as the rookie was still adjusting to the style and pace of MLS play, and had difficulty connecting with his teammates. Now, the man who seems a certainty for Rookie of the Year displayed the composure he has developed, neatly slotting passes and distending Dallas’s efforts to keep its back line together. Schmetzer, never one to count his eggs before they and the basket are locked within a mountainside vault, reminded his team after the game that the job was only half-done. “The talk after the game was ‘we’re not done, we’re not finished,’” he said. “That will be repeated throughout the week, because Dallas is a very dangerous team. We’re not taking anything for granted. We’re going to make sure that we’re going to work hard and smart throughout the week to prepare because we understand what’s going to happen. Wounded, Dallas still presents a significant threat. The Sounders operated Sunday without center back Roman Torres due to lingering injuries from the Kansas City match. His status is unknown for the road rematch. If Seattle’s attack can capture and distill the essence of that eight-minute stretch, they will prove formidable for any foe on the way to a shot at the MLS Cup. Can we remove the “interim” tag from head coach Brian Schmetzer now? What a satisfying game. Hope we can do more of the same in Dallas. One of the biggest offensive tears I’ve seen the Sounders rip off in their MLS history. And it’s another example of why MLS needs to re-evaluate its playoff format. All four top seeds face goal deficits, and the Supporters Shield winner could go home even if they get a 3-1 win. Very unfair. obviously a fan of “Supporters Shield” being the be all and end all of American soccer. However, that is not the way our league has chosen to go. The USA has an historically based need to have a playoff. We pride ourselves in being different from the rest of the world. it won’t change! Deal with it! Have your team plan on being great at the end of the season. If your management can’t figure that out…..ask to join a league anywhere else in the world. I have zero faith in ownership being willing to”settle” on Schmetzer. How will Lagerway justify his salary if he has to hire the fans’ choice, the one who worked the miracle turnaround, the connection to Sounders’ history!